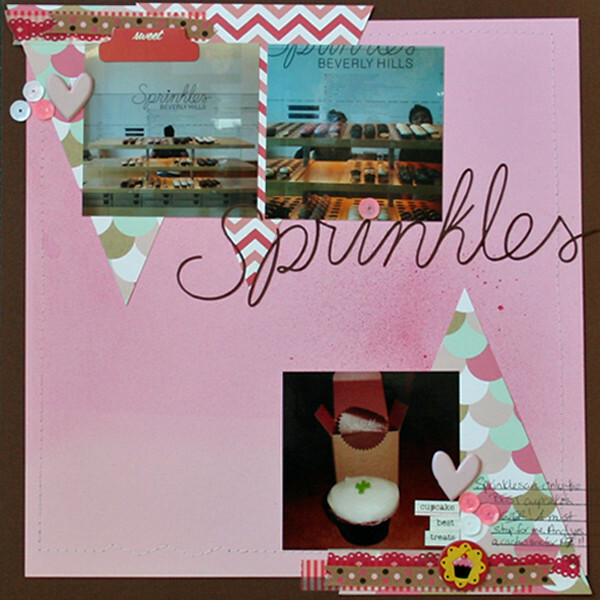 Sprinkles – ScrapMuch? Sketch-y Friday Reveal! Hello!! It’s time for another ScrapMuch? Sketch-y Friday reveal from Team A! This post is going to be a bit short and sweet as I’m fighting a cold, and about to down some NyQuil and NeoCitran and try to kick this bug to the curb. I have no time for this sickness and I need it to be gone pronto! I returned to my one of my favourite palettes of pink and brown! Those used to be my go-to colours for scrapbooking a few years back, so it was fun to return to that. I also had a happy accident with the pink cardstock that it got bleached on my shelf and created the fun ombre look (note to self: scrapbook room should probably have curtains or blinds). Important housekeeping notes!!! There is still time to get your submissions in for the ScrapMuch? design team call! If you don’t want to apply for the design team, but still feel inspired by this months sketches and team creations please play along and share your work for a chance to win an awesome possum ScrapMuch? prize! Here is a run down of our Sketch-y Friday rules. Just link up your creations in our sidebar to be entered into a random draw for our monthly prize. You have until September 29th, at midnight to participate in any of September’s sketch challenges, each linkup tool will remain open until that date! Have a fantastically creative weekend everybody! Gorgeous as always. I love the happy accident ombre, subtle but perfect. Another great layout Tiiu! Love the title….just perfect. The cardstock accident worked out perfectly! Love your colour choices! Sprinkles!!! Yummy! Beautiful layout and the colour choice is just perfect! Great take on the sketch! Love the different patterened papers! Definitely a ‘sweet’ page Tiiu, mouthwatering even! Lol. I love the ombre look of the cardstock…….might have to place some of mine in the sunshine just for fun!